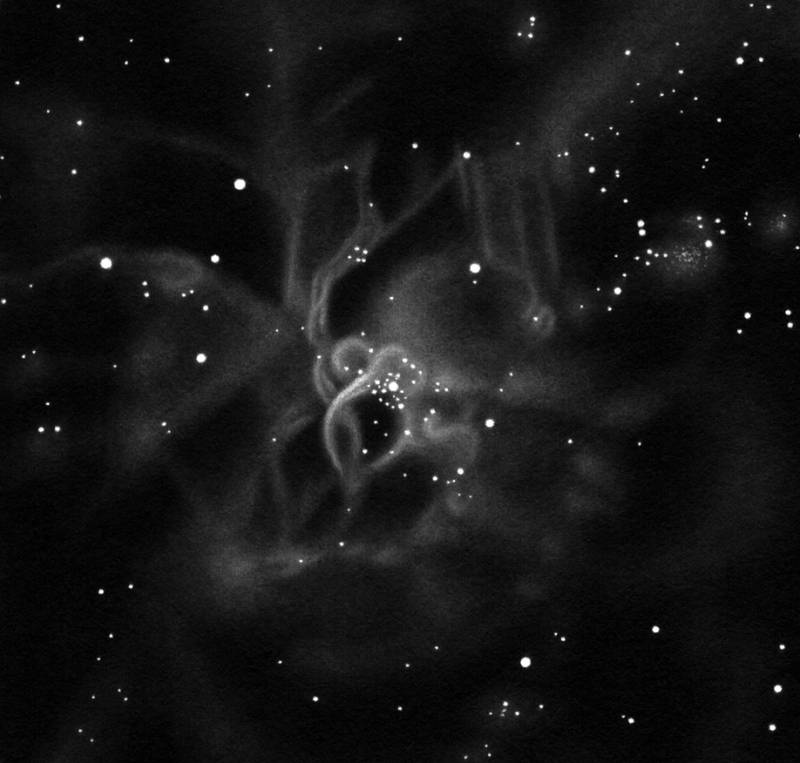 Drawing the Tarantula Nebula also known as NGC 2070 or 30 Doradus was my main goal on our trip to Namibia. I wanted to draw it using the 16" telesope because I remembered that this is one of the most breathtaking deep-sky objects in the sky in a telescope of that size. The inner part of the nebula around the cluster R136 is unbelievably bright and complex. 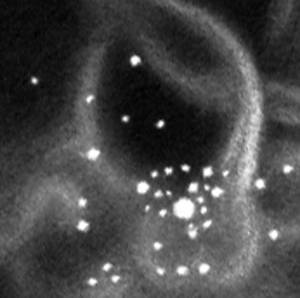 The tangled threads of ionized gas can almost be seen in 3 dimensions. The faint outer regions touch the edges of the 25' field of view. NGC 2070 drawing inverted into positive. 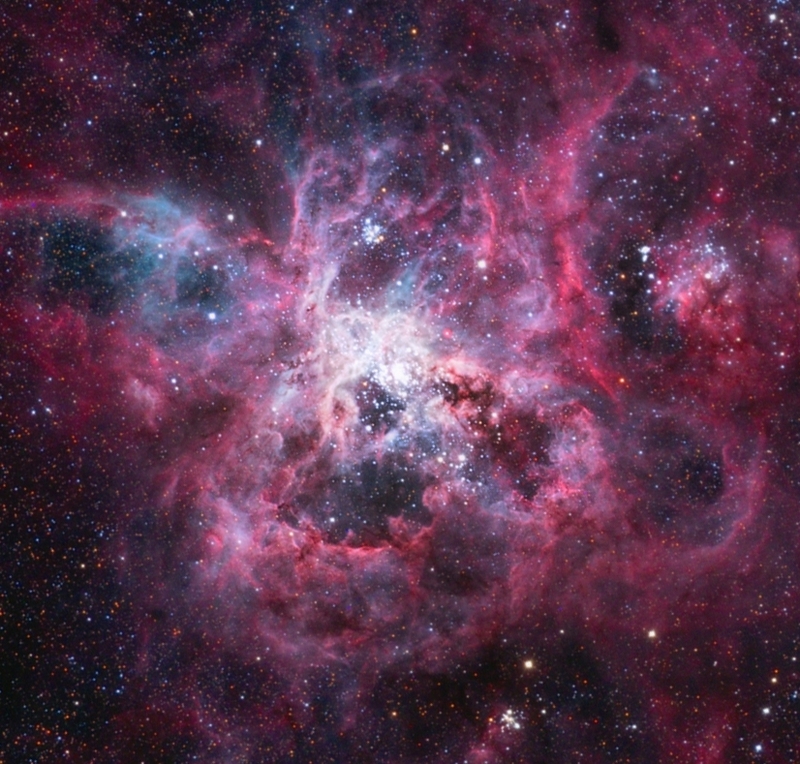 In our Milky Way we can barely find any object similar to the Tarantula Nebula which lies in the Large Magellanic Cloud. It is maybe NGC 3603 that resembles it the most. The cluster R136 in the core of NGC 2070 is thought to be a globular cluster being born. The most massive stars known can be found here. They are primarily responsible fot he ionization of the nebula. The Tarantula Nebula is the brightest and most intensive star forming region in the whole Local Cluster (NGC 604 is bigger). Many other deep-sky objects (e.g. the open cluster Hodge 301) and interesting stars (e.g. 30 Doradus #16) can be found in the drawing. The latter is a runaway star that came from R136. Deep-sky objects in the Tarantula Nebula. It is stunning how many details can be seen in the telescope straightaway. Not much concentration is needed to spot the bright threads inside. But the outer fainter regions are really faint. I used an [OIII] filter as well. But the sketch was at least 95% made without a filter: I drew everithing I saw with or without a filter. I compared the drawing with the photos only in the final stage of processing - almost one year after I finished the sketch under the sky. Towards the end of the nighttime sketching I scoped the whole area with a little bigger enlargement (225x) in search of more details. I still remember the feeling - "Is this all?" - I could not spot any more details. 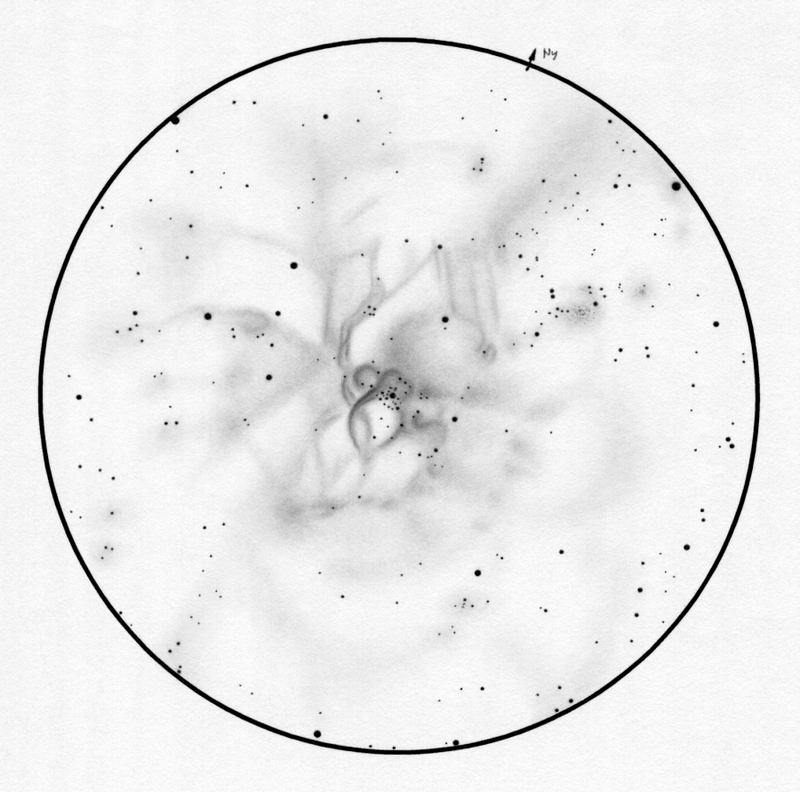 I have already drawn the Tarantula Nebula and its neighborhood before with a much smaller telescope and larger field of view. This is my first sketch that I processed on my 12 cm observation form. Before taking a look into the telescope I didn't know if I wanted to draw the filed in 10 cm or 12 cm size. So I drew two empty circles into my sketchbook. After taking a look into the telescope and seeing the amount of details it was clear that I need to choose the bigger one. Courtesy of László Francsics his photograph of the Tarantula Nebula can be seen above. It was made using a 51 cm Corrected Dall-Kirkham telescope with remote observing. I cropped and rotated the original photo in order to be able to compare it directly to my drawing. The pink color in the photo is due to hydrogen (HII, ionized hydrogen with two main lines: H-alpha and H-beta). The bluish color is due to oxigen (OIII, doubly ionized oxigen). The human eye is not really sensitive to the strongest, red component (H-alpha) in hydrogen's light but the blue H-beta light is well visible. Hence both the pink and the bluish parts of the nebula were visible in the telescope. Of course the colors were not visible in the telescope (though I didn't even look for it). Everyting was grey. 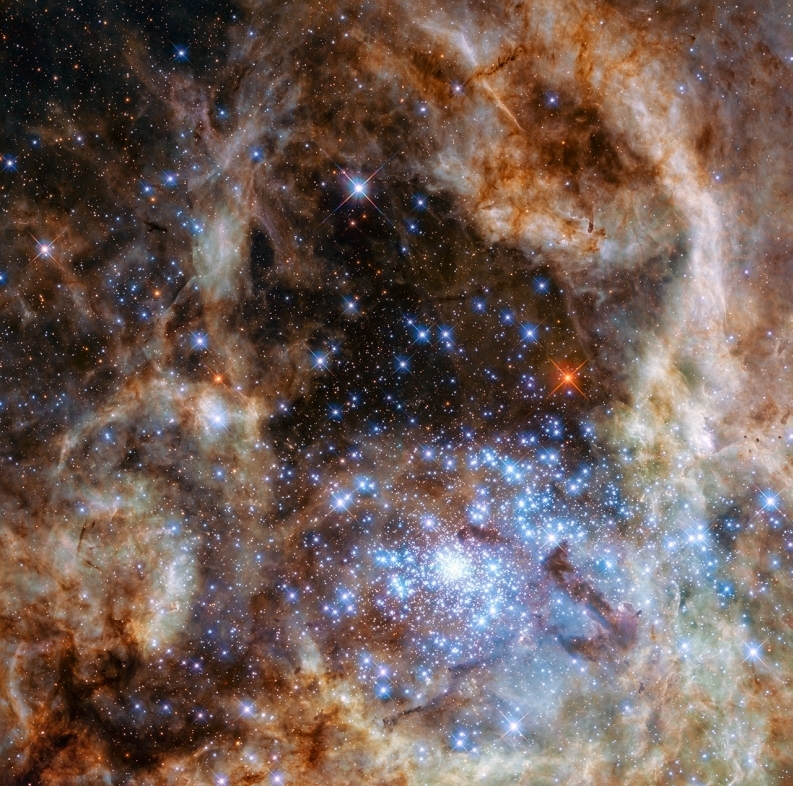 The Hubble (HST) image of the core of the Tarantula Nebula and R136 can be seen to the left. Here I cropped and rotated my drawing in order to be able to compare them. It is interesting that I haven't seen the bright red star to the right of the Hubble image's center. I was surprised that I haven't seen the combined light of the fainter stars of the cluster. Based on the photos I would expect something similar to a concentrated globular cluster. But the view was not quite like that. The same is true for the open cluster Hodge 301: I haven't seen any sign of the faint stars.